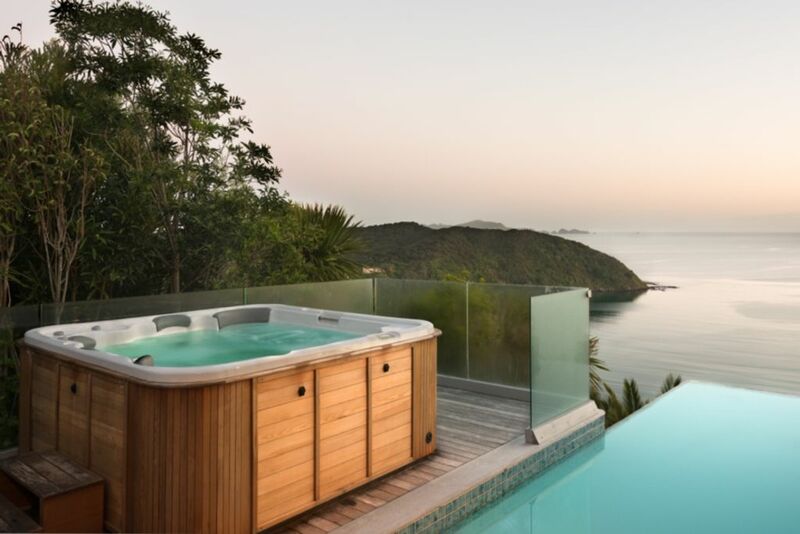 Situated above the town of Russell, Cloud 9 is blessed with views across both the Pacific Ocean and the Bay of Islands in which Russell nestles. Cloud 9 is on a private road and benefits from beautiful natural bush surroundings. There are panoramic unobstructed views of the coast, the land, the ocean and Long Beach, one of the safest swimming beaches in Russell. From this privileged vantage point the crashing waves can be seen and heard some 100 meters below whilst, at night, Kiwis can be heard foraging in the bush. The Villa sleeps six persons in two double bedrooms and two persons in one twin room. Both bathrooms have double basins. There is a large open plan living area that has been equipped and furnished to the highest standards. State of the art entertainment systems including plasma television and Sky TV, are integrated into the house. Cloud 9’s north facing position is not overlooked and thus affords the utmost privacy. Surrounded on 3 sides by kwila decking and terracing the stunning sea and coastal views can be enjoyed from sunrise to sunset, whether from the lounging decks or from the pool and barbecue areas. Inclusions: Pricing includes all linen, servicing every 4th day for stays of more than 6 nights, welcome flowers, and first morning breakfast supplies. Should you desire, a daily service of Cloud 9 can be arranged with prior notice at an additional charge. There is also an additional option of hiring a CHEF for the entire time or just a few nights... What a delightful way to top of your holiday! This service is provided at an additional charge. 5 STAR QUALMARK RATING - This property has been rigorously assessed by Qualmark against robust standards, in order to provide you with the highest possible level of quality is provided at an additional charge. No pets are allowed as we are in a protected KIWI zone. NO SMOKING INSIDE. Located up a private gated driveway - privacy at it's best!! Car parking for up to 3 cars, 1 in the garage and 2 in front. The location is great, the house is modern and comfortable, views are unbeatable. The location is great, the house is modern and comfortable, views are unbeatable. Unfortunately there was a severe water shortage during our stay, but hosts informed us in advance and there was nothing they could've done about it anyway. So, great experience and highly recommended. Thanks. Fantastic view, quiet, private and clean. Fantastic view, quiet, private and clean. Great for a family holiday and not too far from Russell. A great experience all round because care had been taken with the details.